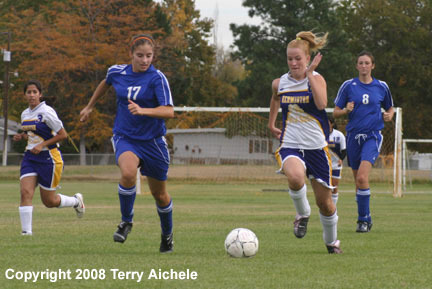 It was senior day for the Hermiston girls soccer team on Saturday, October 18. These are some of the seniors gathered together just before the beginning of the match with Crook County. 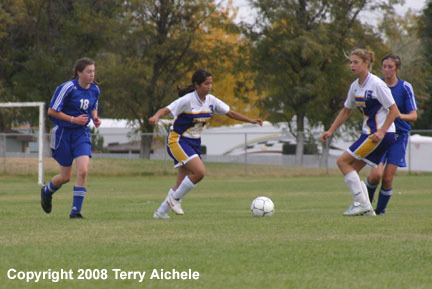 HERMISTON - The Hermiston Bulldogs hosted the Crook County Cowgirls soccer team on Saturday, October 18 at Highland Hills soccer field. 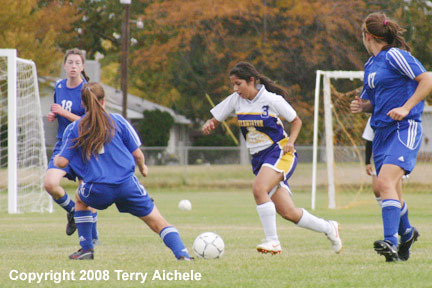 Hermiston won on a goal about 20 minutes into the first half on a shot up the middle by Kelli Jones. Hermiston controlled the ball during most of the first half. Crook County began putting some pressure on Hermiston in the last five minutes or so of the first half. 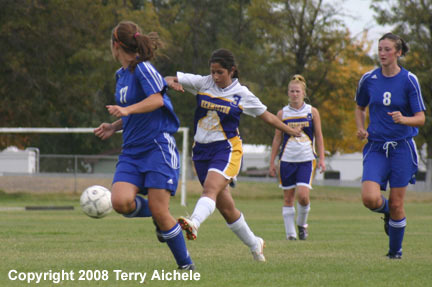 Hermiston controlled the ball well enough that the Cowgirls really couldn't get a good clean scoring opportunity. At about the twenty minute mark of the first half Kelli Jones took the ball about mid field and drove all the way being guarded by two Cowgirls until she took the winning shot about 15 meters out from the goal. The second half was a lot of back and forth and mid field play. Crook County only took two shots on goal. Hermiston did put pressure on occasionally and took six shots on goal. The final score Hermiston 1-0 Crook County. The Bulldogs next match was on October 23 in Pendleton. The Dawgs won 2-1 over the Bucks. LEFT - Kimber Sharkey of Hermiston brings the ball into the Crook County zone. 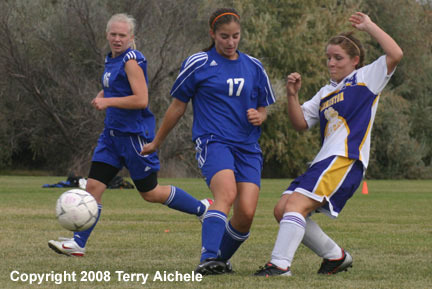 RIGHT - Catie Coleman of Hermiston works her way around a Pendleton defender. LEFT - Hermiston's Jennifer Cardenas and Catie Coleman bring the ball into the Crook County zone. 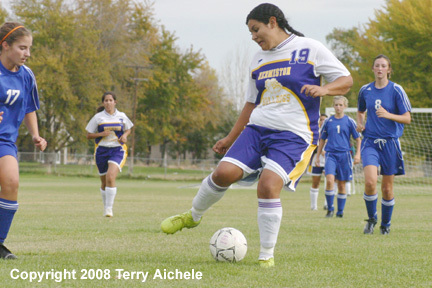 RIGHT - Jenniger Cardenas of Hermiston, in the center, brings the ball into the Crook County zone. 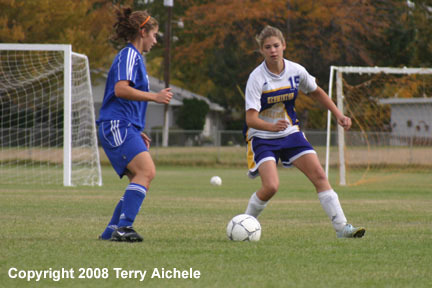 LEFT - Amanda Smith of Hermiston works the ball into the corner of the Crook County zone. RIGHT - Jannet Sotelo of Hermsiston dribbles the ball in the Crook County zone. 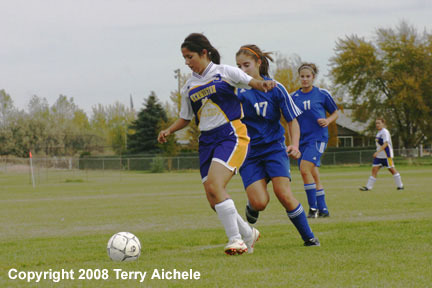 LEFT - Hermiston's Jennifer Cardenas takes a shot on goal. 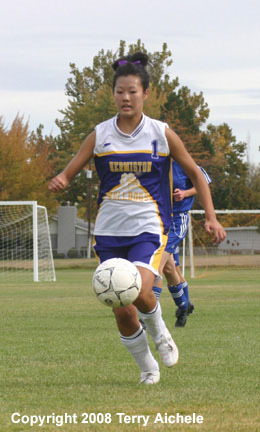 RIGHT - Kayla Sharkey of Hermiston takes a shot on goal.